To say that this novel is set in Lagos is to miss the point—the book is a memoir of Lagos. If Abel Dike is the protagonist, then Lagos is the eponymous antagonist. We see Lagos from multiple angles, multiple extremes. An argument over a few naira can lead to a riot, dropping hundreds of thousands at a night club on Moët Rosé nothing special. Toni Kan, who has been a journalist and editor in Lagos, and has won the NDDC/Ken Saro Wiwa literature prize, knows this city backward and shows us around with attractive prose and harsh insights. It’s frenetic and choked, rags and riches. It is a fascinating if somewhat scary place. Abel longs to follow in his father’s footsteps and become a teacher in the regional town of Asaba where he grew up. However, by the time he achieves this: “Teaching had lost his allure and instead of respectability, it cloaked those who came to it in the garb of penury and poverty.” Nevertheless, he is more or less content until he receives a text message: Soni is missing. Soni is his younger brother who has made his fortune in Lagos. It’s never spelled out just what Soni does, but it’s obviously highly illegal and enormously lucrative. Abel is just at the start of the long school break, so he packs a briefcase worth of clothes and toiletries and heads to Lagos to get to the bottom of the mysterious message. He moves in to Soni’s mansion and, indeed, into Soni’s bedroom, playing uncle to Zeal, his young nephew, and brother-in-law to Ada, Soni’s glamorous wife. Ada was never particularly fond of Abel—who made a silly judgement of her based on the fact that the couple had met at a nightclub—and she didn’t send the text message although it came from her phone. Another mystery. All the police can tell him is that Soni’s Jaguar was discovered crashed into a ditch, but there has been no sign of him since. He tries his best to find out what’s happened to his brother—visiting Soni’s associates and trying to talk with money, but he’s way out of his depth, and even the most friendly of his brother’s associates have their own agendas: “in Lagos . . . trust is a shapeshifer, a mercurial being with ever-shifting allegiances.” He relies on Santos, his brother’s sidekick, to help with the search, and to sort out myriad financial problems, but it’s not long before he discovers that Santos, too, has his own agenda. In the meantime, Abel discovers what it means to have money in the carnivorous city, and slowly he is sucked in to his brother’s lifestyle and, indeed, his life. Whereas at first he wants nothing more than to find Soni and retreat back to his quiet life in Asaba, as time passes he starts to become ambivalent and has to fights his urges—at least to the extent of refusing advances from his attractive sister-in-law. Luckily he bumps into an old girlfriend and reignites that relationship, which takes his mind off Ada for the time being. She turns out to be a “big babe” with the right connections and is able to focus the police on the case. 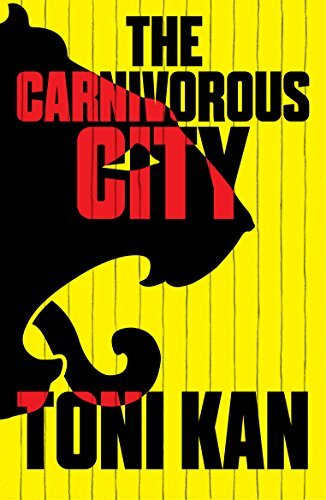 The Carnivorous City is not a thriller or even a mystery in the classic sense. As mentioned at the beginning, the real struggle is between Lagos and Abel as he tries to maintain his values and hold on to his psyche. Although it is Soni who is consumed without trace, it is Abel’s bones that Lagos spits out. Michael Sears writes with Stanley Trollip under the name Michael Stanley. Their most recent book is Dying to Live (Minotaur Books, 2017), the latest novel in the writing team's Detective Kobu series, with earlier entries nominated or winning a number of literary prizes including the Edgar, Anthony, Barry and International Thriller Writers awards.